Due to the most recent announcement that the University of the Pacific has extended its campus closure because of concerns with air quality in Stockon, the Pacific women's volleyball team must relocate for the second time this weekend. Scheduled to host No. 1 BYU on Saturday, Nov. 17, the two squads will travel to Aptos, Calif. where they will wrap up their season series at Cabrillo College. The match is set for 1:00 p.m. and all fans will receive free admission. Pacific will be unable to provide a live stream, but will provide live stats for the match. 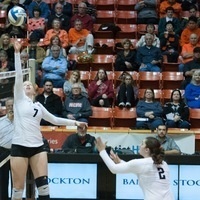 Fans can access the most up to date information at pacifictigers.com and via twitter at @PacificVball.